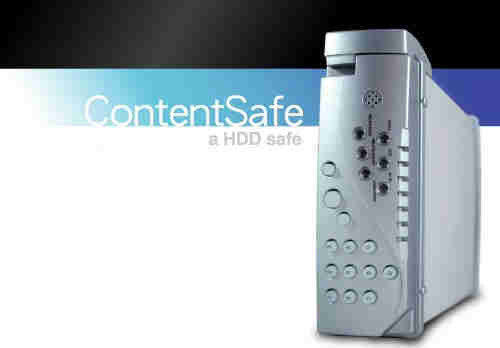 This unit uses a keypad to prevent unauthorized user from access the content in the disks that has been protected by the unit. A disk is protected by the unit when a new disk is placed in the unit and going through the format procedure. The unit once connected to the host, the LEDs on the unit will be lit to indicated that the user has press the PIN via the keypad on the unit. A failed PIN check will result in not being able to see the unit on the host. When the PINt is accepted, the USB 2 interface then starts to function and to allow the host to see the unit. Any attempt to remove the disk from the unit and to be placed the disk in other external disk enclosure or other system internally will see a blank disk, hence the content is protected. This unit is perfect to house a new concept parasitic computing PPC (Parasitic PC) . The unit will protected from unauthorized access to the content that is only for the people intended. The unit is tempering proof meaning when the content in the HDD used in the enclosure will not readable outside the enclosure - HDD is locked with the enclosure. Each unit is individually constructed so swap units or disks will not exposed contents. The security implemented on the unit has multiple levels for different roles; it is most suitable for structured organization. The unit is OS independent and it is powered directly by USB 2.0 port(s) - the product comes with a Y cable for USB ports. This product not only protect the unauthorized access but also support the rightful owner the right to access the information - if a user forget the PIN chosen at the first place. A web interface is available to allow the user to reset the unit so the ownership can be reestablished. For business and government agencies who like to isolate the support from Transcom, a process and procedure is made available for that purposes so the protection can be complete - even from the engineers and staff in Transcom.